A compost crock is simply a container to put your kitchen waste in while it waits to go out to the compost pile. Any container will do. For years we have used a 1 gallon dry wall mud plastic bucket, leftover from a home rehab project. It does the job--it collects the food scraps and has a lid which, when we put it on, keeps out some of the fruit flies. But the old plastic bucket is a little lacking in the aesthetic department. 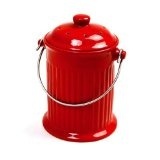 Now you can buy compost crocks made of all sorts of materials--ceramic, stainless steel, plastic, even bamboo. Some have special filters to help absorb the smell. Some are big and some are smaller. Size--how much kitchen waste do you produce and how often do you want to run out to the compost pile? Weight--I have used a beautiful ceramic crock but it was so heavy that when filled with kitchen scraps, it was uncomfortable to carry outside. Lid--how easily can you open and close it? When you cook, do you like to have an open crock so you can just throw the food in? Do you want a lid that closes tightly to reduce smells and fruit flies, or do you want something that opens easily? Cleaning--Does the bucket fit under your faucet easily for cleaning? Is it made so you can really rinse it out or is it hard to get to the inside pieces. "Greenness"--Is the compost crock made of a green material? Is it made to last or will it need to be replaced fairly quickly? Plastic--If you get a plastic compost crock, the plastic can get stained and hold the food odors. Eventually it may get harder and harder to clean. Also, is the plastic recycled? Aesthetics--Do you like how it looks? 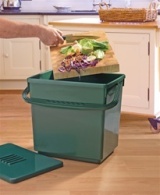 Does the compost crock look good in you kitchen? This is one of the prettiest crocks I have seen. 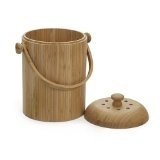 This is made of natural bamboo and has a charcoal filter in the top to absorb odors. The lining on the inside is removable and dishwasher safe. You can really get it clean between uses. This ceramic compost container is lovely. It comes in 2 colors--red, and white--and a stainless steel version. Since this is made of ceramics, it is a little heavy. This is not a big problem unless you have issues about carrying items (arthritis, etc.). It also is a little small (1 gal capacity). It would be best if you go to the compost pile a lot or your are a small family. 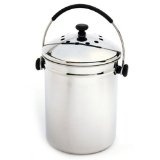 If you have sleek, modern, stainless steel appliances, you may like this crock. It would be quite nice on sitting any counter top, but especially in a modern, updated one. This compost pail has a charcoal filter. It holds one gallon. 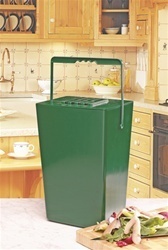 This compost caddy is huge--it hold 8 gallons of kitchen scraps. You won't be running to the compost pile often with this pail around. It's size makes it perfect for large families or people who really eat a lot of vegetables. This compost pail is made in 100% recycled plastic. It has a charcoal filter in the lid to help reduce odors. 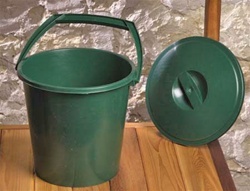 This compost bucket is lightweight, sturdy and made of 100% recycled plastic. And what's really cool is that it has a charcoal filter in the top which absorbs odors. Ever had old onion bits sitting in you compost bucket too long? Now you can control the smell. The filters last 4 months so you only have to replace them a few times a year. It holds over 2 gallons of compost. 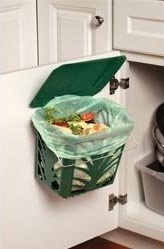 You can't get any simpler than this clean looking compost pail. It's cheap and easy and holds over 2 gallons of organic waste. The lid is tight fitting to keep pests and smells to a minimum. This Compost pail is very interesting; it is based on promoting aerobic decomposition. The pail is ventilated on all sides. The pail is lined with a BioBag. BioBags are bags made from cornstarch and completely degrade. They breathe, allowing heat and moisture to escape, and air to enter the bag. If you have trouble remembering to empty your compost crock, you may consider this. It will encourage aerobic decomposition which will tend to reduce smells. This pail is designed to sit on the counter top or to hang inside a door of a cabinet. It holds almost 2 gallons.